"Clearly, the Assad regime did not get the message last year," Defense Secretary Mattis said. "This time, our allies and we have struck harder." The president said the U.S. would aim to hit sites "associated with the chemical weapons capabilities" of Assad's regime. "We are prepared to sustain this response until the Syrian regime stops its use of prohibited chemical agents," Trump said in remarks from the White House, adding that the U.S. and its allies had "marshaled their righteous power." Trump urged Iran and Russia to withdraw their support for what he called Syria's "barbarism and brutality." In a direct address to the two countries, he asked, "What kind of a nation wants to be associated with the mass murder of innocent men and women and children?" Russia, one of Assad's key and uncompromising allies, denounced the attack shortly after the strikes were reported. President Vladimir Putin called them an "act of aggression against a sovereign state" that will make the humanitarian crisis in Syria worse and called for an emergency meeting of the United Nations' Security Council. Putin added that the strike had a "destructive influence on the entire system of international relations." At Russia's request, the U.N. said the Security Council will hold an emergency meeting at 11 a.m. ET on Saturday. The suspected nerve agent attack in the city of Douma in eastern Ghouta on April 7 killed dozens of people, including children, local activists have told NBC News. Syria and Russia have denied any involvement in the alleged attack. On Saturday Putin reaffirmed Russia's view that the purported chemical attack was a fake, criticizing the U.S. and its allies for launching the strike without waiting for inspectors from the international chemical weapons watchdog to visit the area. The Organisation for the Prohibition of Chemical Weapons said later Saturday that its fact-finding team would continue a planned deployment to Syria to help establish the facts around the suspected chemical weapons attack in Douma. The airstrikes drew support from the European Union, Germany, Israel and other allies while British Prime Minister Theresa May said reports indicate the Syrian government used a barrel bomb to deliver the chemicals used in an attack on Douma. She said the use of force was "right and legal" in this case. Meanwhile in Syria, explosions were heard to the east, west and south of Damascus, and witnesses saw blasts surrounding much of the Syrian capital and a huge fire could be seen from a distance to the east. An Associated Press reporter in Damascus said the attacks turned the sky orange. Gen. Joseph Dunford, chairman of the Joint Chiefs of Staff, said the U.S. and its partners launched the attack at 9 p.m. ET and struck multiple targets associated with Syria's chemical weapons program. Those targets included a scientific research center in Damascus, a chemical weapons storage facility near Homs, Syria, and a chemical weapons equipment and military outpost close to the second target. Dunford explained that the U.S. identified the targets to mitigate collateral damage, civilian casualties and "the risk of Russian forces being involved." He also said that the U.S. had noticed surface-to-air missile activity from the Assad regime. Russia's Defense Ministry said out of the 103 missiles fired, 71 were downed — with Syrian air defense systems intercepting most rockets fired. Trump tweeted early Saturday morning in praise of what he called "a perfectly executed strike." At a news conference at the Pentagon after Trump spoke on Friday night, Defense Secretary James Mattis described the strikes as "a little over double the weapons" used by the Trump administration to carry out a similar attack one year ago. That April 2017 attack consisted of 59 Tomahawk cruise missiles. "Clearly, the Assad regime did not get the message last year," Mattis said. "This time, our allies and we have struck harder. Together, we have sent a clear message to Assad, and his murderous lieutenants, that they should not perpetrate another chemical weapons attack for which they will be held accountable." Mattis said the strike was a “single shot” aimed to deter the Syrian regime from using chemical weapons. Whether the United States and its allies will pursue further action in Syria would “depend on Mr. Assad should he decided to use more chemical weapons in the future," the secretary said. Mattis also noted his concern that false information would be spread after the U.S. attack. "Based on recent experience," he said at the conclusion of his remarks, "we fully expect a significant disinformation campaign over the coming days by those who have aligned themselves with the Assad regime." There would be further details in the morning, Mattis and Dunford said. The Syrian Foreign Ministry, in a statement provided to state-run news agency SANA, said that it "condemns in the strongest possible terms the brutal American-British-French aggression against it." The Associated Press reported that hundreds of Syrians gathered at landmark squares in the Syrian capital, honking their car horns, flashing victory signs and waving Syrian flags in scenes of defiance that followed the unprecedented joint airstrikes. The British Armed Forces said they scrambled four Royal Air Force Tornado GR4s to launch Storm Shadow missiles at a missile facility where the Syrian regime is believed to be storing chemical weapons. Saturday morning, British defense secretary Gavin Williamson told London-based national talk radio station LBC that early indications suggest the airstrikes were "a highly successful mission." 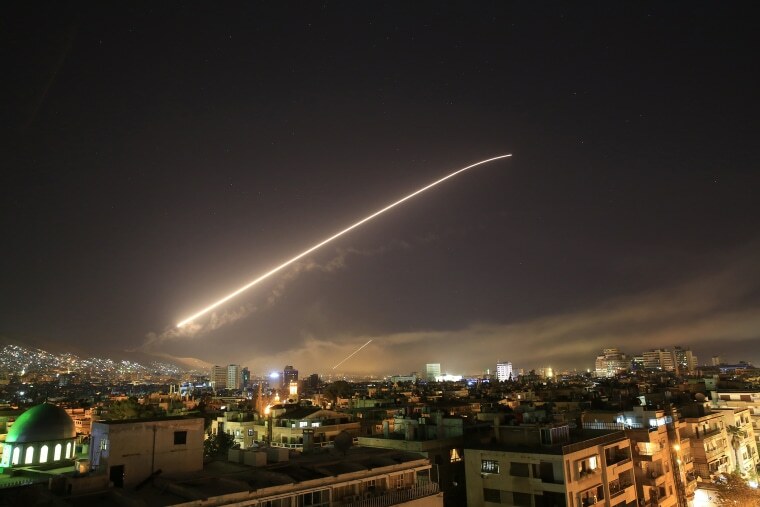 "We believe that the strikes we have taken last night have had a significant impact in terms of what the Syrian regime can do in the future," Williamson said. In a news conference in London on Saturday, May reiterated her conviction that Assad's government forces were behind last week's chemical attack and said that the West had tried “every possible” diplomatic means to stop Assad from using chemical weapons. “But our efforts have been repeatedly thwarted” by Syria and Russia, she said. "I believe this was the right thing to do. I believe it's in our national interest," she said. Asked if the U.K. would consider another strike if the chemical attacks in Syria continue, May didn't elaborate but said the Syrian regime should be in no doubt about British resolve. Although of a lower order of magnitude, May said, the use of a nerve agent on the streets of the U.K. in recent weeks is part of "a pattern of disregard for these norms," referring to the poisoning of former double spy Sergei Skripal and his daughter, Yulia, in Salisbury last month that has been blamed on the Russian government. "So while this action is specifically about deterring the Syrian regime, it will also send a clear signal to anyone else who believes they can use chemical weapons with impunity," May said. French President Emmanuel Macron agreed with May's sentiment and said "the red line set by France in May 2017 has been crossed." "We can not tolerate the trivialization of the use of chemical weapons, which is an immediate danger for the Syrian people and for our collective security," he added. Macron's minister of foreign affairs, Jean-Yves Le Drian, called the joint operation in Syria “legitimate, proportioned and targeted." Upward of 500,000 people are thought to have died in the seven-year Syria civil war, a conflict that has also driven millions from their homes. The war has sucked in a number of actors — including Russia, Iran and Iran-backed Lebanese militia Hezbollah on the side of Assad. Russia’s 2015 decision to enter the conflict, backing Assad, turned the tide of the war and helped government forces recapture much of the territory held by rebels. Trump had previously shared his desire for a rapid withdrawal from Syria, which drew unanimous opposition from the Joint Chiefs of Staff, the Pentagon, the State Department and the intelligence community, who've argued that keeping the 2,000 U.S. soldiers currently in Syria is key to ensuring that the ISIS terror group does not make a comeback. Last year, Trump said that the use of chemical weapons in Syria "crosses a lot of lines for me." On April 6, 2017, the Trump administration launched strikes on a Syrian-government airfield in retaliation for a chemical attack on the town of Khan Sheikhoun. This is a breaking news story. Refresh for updates. Ayman Mohyeldin, Yuliya Talmazan and Associated Press contributed.